Is This Bump on my Foot a Wart? So this bump on your foot isn’t going away. It hurts when you press on it and when you are working out in the gym. Is is a callus? Is it a wart? What is it doc? 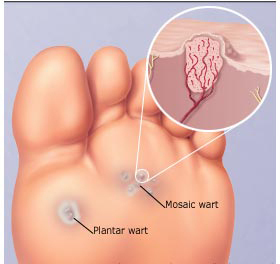 Plantar warts are growths that often appear on the weight-bearing surfaces of your feet. This pressure also causes plantar warts to grow inward underneath a hard, thick layer of skin called a callus. So that wart is bump is probably BOTH a wart AND a callus. Plantar warts are caused by HPV. The virus enters your body through tiny cuts on the bottom of your feet. Children often get warts because they haven’t built up an immunity to them. Each person's immune system responds uniquely to HPV. Not everyone who comes in contact with it will develop warts. People in the same family react to the virus differently. So, if you aren’t sure what the heck that bump is, come in and we will check you out!